One day, when he was home alone, Zippy had a dream. 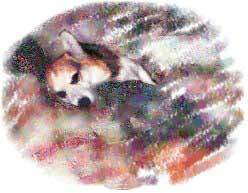 In his dream, he remembered when he was just a little puppy, and his folks had left an apple pie on the kitchen table. When his folks weren’t looking, Zippy had jumped up on a chair and had stolen the last slice of pie.